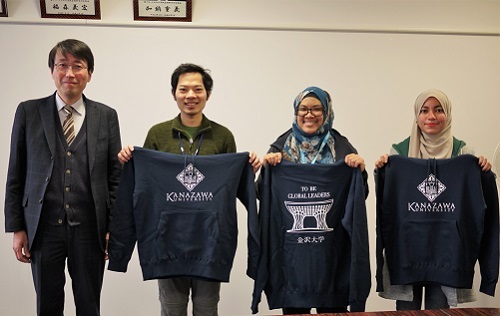 On Feb. 14th, 2019, the award ceremony for the KU original hoodie design contest hosted by International Student Committee (ISC) at Graduate School of Natural Science and Technology (GSNST) took place in the GSNST dean’s office. The idea of the contest was started when an ISC member said that why there was no university hoodie in KU. Then ISC organized a design contest for KU original hoodie. ISC called for a design that include KU official logo and 10 designs were submitted. All of those designs were posted to the ISC Facebook page for fan vote. 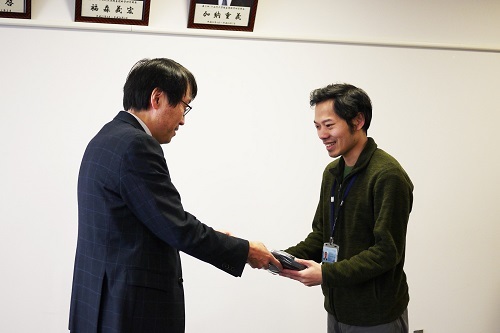 As the result of the fan vote and the points given by the judges, the dean of College of Science and Engineering Professor Aoki and the dean of GSNST Professor Morimoto, and international student advisor Assoc. Professor Kishida, the design by Mr. Huynh Quang Thien was selected for the ISC original hoodie. His design involves original logo of Tsuzumi-mon as a symbol of Kanazawa City as well as KU official logo. At the ceremony, the dean of GSNST professor Morimoto presented the produced hoodies to the winner Mr. Huynh Quang Thien, the 2nd winner Ms. Aqilah, and the 3rd winner Ms. Nur Izdiharr. Copyright © 2019 Kanazawa University.